"My sister is completely happy, my family's never been happier"
Rob Kardashian said Kim and Kris are happy. 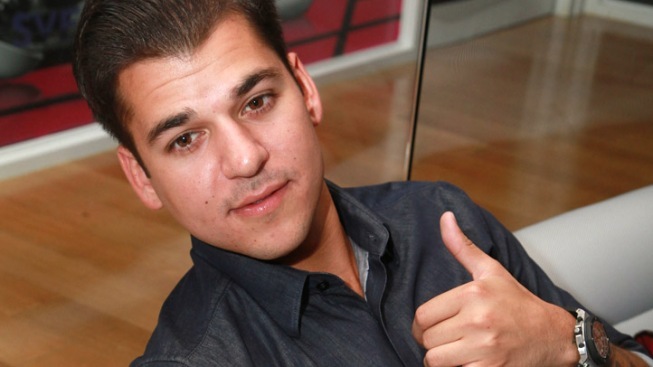 Rob Kardashian is standing up for sister Kim, who tabloids are suggesting is having trouble in her marriage to basketball star Kris Humphries. "My sister is completely happy, my family's never been happier," Rob told Access Hollywood as he rehearsed the tango with partner Cheryl Burke for Monday's "Dancing with the Stars." "She just got married so she should be happy." Rob insisted that the tabloid attention on Kim's marriage doesn't bother him. "Not really, 'cause that's the world that we live in," he said. "It's all about trying to break up newlyweds or trying to create drama over nothing. That's just media and like I said, the world we live in, and we have never listened to those comments or else you're gonna drive yourself crazy and break up your own marriage." Not focusing on tabloids, Rob is concentrating hard on improving his ballroom skills. "It's kinda shocking that we're still here, to me," he said. "I definitely didn't expect that going into the competition, but now that we are here [this] definitely has given me that confidence and I just want [to] like improve even more and try and get to the top spot," he said. Rob hopes to improve, but he has no plans to pull a Maks and go shirtless in the ballroom. "Never," he told Access. "I'm not even the type to take my shirt off."